We loved this cabin and it's close proximity to Grand Marais, as well as Lake Superior. The only thing we would change would be adding blinds or curtains on the windows facing the Fox Fire cabin next door. The experience of renting the home was great. The location was great. The view was outstanding! The sleeping accommodations were perfect for our group. It was all one level which was perfect for our 84 year old father, but it is not completely handicap accessible. It would be better if there could be a sidewalk leading up to the home instead of uneven pavers. This made it difficult for him to get in/out of the home to enjoy the town. The cabin was clean and well-stocked. We really liked the gas stove in the living room. Views were wonderful, nice touch with the lighting on the outdoor stairways. Nice-sized fridge, plenty of storage and kitchen utensils. Our only complaint was the wi-fi. Sometimes it would not hook up at all, sometimes my device could find the account, but the password would not work, a couple of times I was able to get hooked up. But then again, who needs the internet when the North Shore beckons? It was VERY easy to access the home, and it was great. The size was great. Room set up was perfect. Wonderful to have wifi and DIRECTV. The only negative was how old the showers are. Aside from that, it was a wonderful place that we'll likely stay again. Despite rainy weather, we had a gorgeous weekend at Chateau LeVeaux. We enjoyed the pool and hot tub, the lake views (and lake access), and the condos! We loved everything, as always. This is a great location, and the condo is perfect for two people. It would be lovely if you offered bikes to use/rent for the trail so that people don't have to bring their own. Just an idea. The entire house and location were great. Nice area downstairs and middle floor. I would have King size beds. We absolutely loved our stay at the Governors cabin! It was clean, cozy and perfect for our annual girls weekend. The in town location was convenient allowing us to walk to restaurants, shopping and local music while the cabin was super comfortable for cooking in and relaxing. We love staying at amazing grace. We love the view of the lake, hearing the waves, watching the sunrise and enjoying the energy of the lake. The cabin is beautiful and more than meets our expectations. We like the updates to the amenities of the cabin: for example, the bathroom updates, the new stove, the new refrigerator (although the new refrigerator is much much larger than we would ever need). In Grand Marais, we love the shops, the restaurants, and the wide, wide variety of people that we see there. We also think grand Marais is perfect for its location and proximity to all the state parks. We go hiking every year we come up. We love the view to the lake with floor to ceiling windows. The wifi, which unfortunately is a must, has been greatly improved. All of the rooms are good size. Parking in front of the unit to unload and load the car is great. The side deck to enjoy the view right off the dinning area is a plus. The front porch was also enoyed! Home was beautiful and very comfortable. Location was great. Instructions for entering and leaving the house were very clear and easy to follow. Stayed at this private rental within Suites Hotel in Canal Park in Duluth. Convenient location that is easily accessible from the highway and within walking distance of everything in the Canal Park area. We were there for a wedding and many guests were in the hotel/suites rooms. By comparison, this rental was much nicer, was homey/personalized and decorated more comfortably than the hotel rooms that I saw. The rental is quite spacious and the pictures reflect accurately what it looks like. Check in was easy - went directly to the rental location, obtained key from lock box which was located exactly where described, no problems. There were instructions with detailed information about the rental, parking, etc readily available. Entire place was clean, well-furnished, the beds/linens were very comfortable. Didn't use the fireplace, but looked very cozy. Didn't use the Xbox or radio system, but are definitely good options to have. Views out of the extremely large living room windows look northwest onto the downtown area. Appreciated the iron and full size ironing board that were available. About the only concern I would voice was the large rug on floor near the door - we tripped on the edge closest to the dining table multiple times - it seemed that others have as well since the edge was not flush with the floor and none of our efforts were successful at keeping it completely flat. Entire rental process was easy - all done online. Received confirmation emails quickly and specifics about accessing the rental were sent with much advance notice. Would definitely rent again if we were back in the area. Lake Superior put on an incredible show for my daughters and I. The cabin is amazingly close to the waters edge. Although a little small, the cabin was neat and clean. The heated bathroom floor was a big plus. We found the beds too hard to be comfortable for us. There were plenty of blankets. The bottled water was very much appreciated! This IS a darling little cabin, and I feel a great value for the fabulous location. I loved listening to the waves, and viewing from the big windows. Great location, very comfortable accommodations, great bed! The Sunrise Hollow property is in an idyllic location RIGHT ON Superior's shore - complete with the lovely and calming sound of the waves. The massive stone fireplace (with LOTS of firewood) helps create a cozy and "escapist" atmosphere around the well furnished living/dining area. The "cabin" (really a home) has a well equipped kitchen (including a brand new dishwasher), and bedroom space is more than adequate including lots of closet space. There is even an adjacent "guest house" that sleeps two for those who may want to take a "break" from other friends/family members. The portable fire pit outside was an extra nice touch that made it easy to enjoy cooler fall (or spring?) afternoons/evenings. Also, the quick trip to Grand Marais (as well as a great variety of Superior Forest hiking trails/Cascade & Temperance state parks) made for a convenient location for "day trips." All was a truly relaxing get away. THANKS!!! 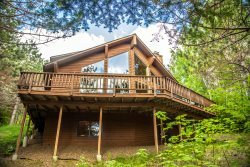 Unique, private - exactly what we were looking for: a nice, smaller home on Lake Superior. Wonderful deck and porch. Very beautiful and convenient location near Grand Marais. I love that your website has a pet-friendly section -- that was very helpful and time-saving. We were very excited to spend some time in a cabin, away from other people and close lakefront access. Just driving into the lot had us locked into the up north experience. The cabin was perfect in every way. Well stocked, very clean, comfortable and the windows looking out to the lake stopped us in our tracks. Location was perfect for what we hoped to do. We drove up to Grand Marais and had a lovely lunch at Harbor House Grille, hiked Temperance River and just sat outside basking in the beauty and sound of Lake Superior. It was very hard to lock up and drive away. We are grateful for the owners sharing this idyllic location. We loved our stay here. When the fridge didn't seem to want to work, the caretaker went out of his way to get us ice.